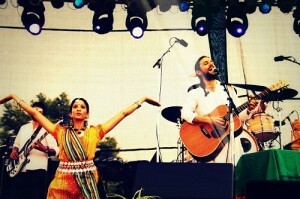 I feel more at home in India and we’ll be able to share with each other to make a very beautiful thing in the end. We also aim towards bridging the gap between the East and the West through our music/dance and through open dialogue, which we hope to document and film. When I think of Tyagaraja Welch there is one word that comes to mind – sincerity. When he performs live, he will sit with his acoustic guitar and sing as if his heart is ready to burst and each syllable were his last breath. That is no act but the real deal. Welch is someone who lays himself bare in front of an audience and, ironically, that is more a million times more rebellious and challenging to an audience than the booze and tattoos rock bands you so often see in clubs. Say what you want, love or hate his music, but you have to give the guy some respect for his honesty and for being true to his vision. This month, Welch kicks off his tour of India at Khon’s and we had a nice chat with him about his music and the country he would be visiting again this month. FPH: I wanted to just talk with you about the whole tour. I know you did one last year. Why don’t you just explain the whole tour, how it came together the first time, and why you embarked on it to begin with. We have some friends that live in Mumbai who have made major connections. They’re encouraging us because the underground indie rock and arts scene is blowing up and if you have a right state of mind you can make anything happen in Mumbai, as you would anywhere. They are doing it. Our friend has already turned out a role in a major Bollywood film. So, they were the ones that pushed us over the edge. We were going out to India again anyway so this time we just changed our focus and we’re really going there to pursue music and art. FPH: Oh wait, so the previous jaunts to India weren’t music trips? Tyagaraja: Well not completely. If I’m being entirely honest, I feel that most of the general public that I perform for and even some of my close friends don’t really connect or understand what we are doing. I’ll get back to the previous jaunts. First, I was Jonathan, then I came back from some inner quests and studies with my teacher as Tyagaraja. It was just frankly weird to some…weird to even my best friends and family. It took time for people to realize that this was not an act; I live and breathe this lifestyle. It’s very real for me and this trip to India makes sense for us. FPH: How do you mean? 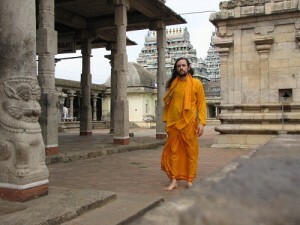 Tyagaraja: …because of my great reverence for and better understanding of Indian culture, I feel we have a deeper and more expansive chance of connecting with the people of India. Some young Indians reject their traditional and cultural upbringings in their search for something else, but at the same time being Indian is not something they can escape – it’s in their blood. So we can connect with their eastern and western identities (pauses and laughs) aaannnnddd we play amazing powerful rock music! It’s just an overall win win for them and for us because our music is just as authentic as anything else in our lives. It’s not some western bubblegum pop music, it’s the real deal, organic. So we feel we have a better chance in India than we do in the states. Not that we are abandoning our own country, it’s just that I feel more at home in India and we’ll be able to share with each other to make a very beautiful thing in the end. We also aim towards bridging the gap between the East and the West through our music/dance and through open dialogue, which we hope to document and film. FPH: Some people just go and play a show for an audience and leave but you are also connecting with the culture. So I dunno it just seems a there is a little more there than the usual tour thing. Again I’m probably romanticizing this because India sounds so exotic. Tyagaraja: Well, India can’t escape its own mystic quality. What we don’t understand or know of becomes “exotic” or “mystical”, while it’s a simple lifestyle for the people of India – there’s no mystery or romance. Its atmosphere is just much more conducive to the life of a pilgrim/an ascetic and that is what my soul wants. To generalize, people in this country don’t understand it, and they don’t make it easy for a person to live like that. This country is hard on people – it’s a grind and it ruins people’s sense. FPH: Well, India has its own grind. Don’t they still have that whole caste system thing going on? Tyagaraja: Dude, everywhere in the world has a “caste” system and yes India’s segregation is still very powerful in certain parts. The economic disparity between the few wealthy and the majority poor is far greater and dire than it is here. There is now a growing awareness about these issues within the society. There are still immense problems in India, I simply mean for the life of a pilgrim. There is a certain honor, dignity and respect which makes it easy to live that way [in India]. That life is not celebrated here. In India, people who give up material life for the search of God and inner beauty can be highly revered. There are some in India that consider them bums and/or fraudulent (and to be honest some of them are), but we never really know what circumstances led them to live like that, what pain and suffering they must have endured. I have never seen more pure-hearted devotion in a group of people than I have seen in India and that is something I value. Love and devotion can carry you very far. FPH: ..and upon seeing that for the first time, how did that affect you? Tyagaraja: I exploded into millions of pieces of joy and covered the landscape with a blanket of love and gratitude. I truly felt unworthy to witness such a thing! It made me want to seek my inner-self even more and it also put my whole life into perspective. That is something that this country also lacks. At the same time with this “Occupy Wall Street” movement, you can see the pure devotion toward fellow people in the hearts of our American youth and it’s very encouraging. FPH: Do you think a lot of the problem in the states is people’s cynicism or is it something else? Tyagaraja: I think it’s really just delusion – people are blinded by the machine that tells them what to do, how to think, and what is important. Most people are searching for things externally, become greedy and forget how to remain human. People need to take the time to slow down and look within. The problem is not with the people in search of true humanity – they are fine and will make it – it’s the people that are blinded and controlled, who need love, and inner search the most. FPH: Let me get back to the tour. You mentioned “work” earlier. What did you mean by that? Tyagaraja: Well, my wife was laid-off by cuts made by Rick Perry and I finally quit my job to dive into my music career full time so for us art, music, and life is work. It’s quite amazing and liberating and very very difficult; You never really know if you are still sane or not. The thing about India is that people still read the newspaper there and millions live in concentrated areas, so it’s very easy to get exposure. The press can carry you a long way because there is such a mob mentality over there. As soon as you hit it, millions of people are watching you. If you work hard and are aggressive with your passions, you can make anything happen in India. That work ethic is applicable universally, but is taken to another level in India where things are moving fast. Every kind of business is booooooming out there right now. Plus, we actually stand out quite a lot in India. What I am and what I do is not that common over there (nor is it here for that matter). Only in the last 10-20 years have they started fusing more rock guitar and rock music into Bollywood movies. Not that Bollywood is everything, but it is quite the mecca of entertainment. It is the largest film industry in the world! As soon as something comes out in Bollywood, it’s instantly a huge success. Plus, there is a huge movement of young people mobilizing right now against corruption and this music and the scene goes hand in hand with that. Tyagaraja: Yeah, it really is happening all over the world. There is a 70 year old man, Ana Hazari, who went on a hunger strike as a part of an anti-corruption movement. That spark has turned into a flame and a real movement is happening again much like what Gandhi and countless others have been striving for in India. We also want to go to India to give back in our own way. I hope to learn from as well as to improve the lives of the people that we cross paths with and contribute to sacred programs that preserve the Divine Knowledge and ancient Indian culture. The path is just endless there, and it can be a shared relationship. FPH: How has India affected your music? Tyagaraja: Well, regardless of what my music sounds like India has had a huge impact. India and my experiences there – especially this last trip in July 2010 – left a huge impression in my subconscious and every single stream of thought or artistic expression has come out of that. My newest song, “The Meaning of Life,” was spawned from some of that connectivity. Tyagaraja: OK, when I was in Madurai, I went to the famous Meenakshi temple. It’s an extremely powerful place – some parts date back to 3000 years. No joke! I sat for 8 hours a day for 3 days straight inside the temple meditating. I became intoxicated with the amazing dance of the temple. I was in a dancing love affair with the energy that some may call God and I can draw on this experience at any time. It made me realize that time is only in the mind, while memories and history are all piled inside of God consciousness – constantly happening at every second – this is the basis of my entire thought process. FPH: How do you see what you did before after having those kinds of experiences – both MYD and your solo work after? Tyagaraja: Love. Love can make you see anything. Even at the point of MYD, I was still meditating. I had just been certified to teach yoga when MYD began. Million Year Dance song was called “Met with the Soul,” a rock ‘n roll instructional on how to meditate and what happens to you in the process. Reading “Autobiography of a Yogi” by Paramahansa Yogananda was a life changer for me; it became my bible and my way of life changed forever. Before that, it was my father that granted me the loving sight of equanimity. FPH: Do you see your art differently now or is more of a continuum of the same thing? Tyagaraja: …almost a continuum. I can’t right self-hate or anything really that negative anymore – it’s just not in me. I can remember a song of mine I wrote in high school called “Uni-God incorporated”. It was my teenage philosophy that I took all the best qualities of my spiritual studies and made my own philosophy out of it. I think everyone should do this. Everyone should be their own source of divinity. FPH: How does that divinity play into music? Not just for you but in a very broad universal way? Tyagaraja: Music is the voice of God or angels and it can also be the voice of hatred and anger. It’s just how you harness it. I’ve always felt that I have no control over what I do; I am merely a vessel and the energy of music surges through me and out on to the paper, guitar, or out of my voice. When I am singing, it’s my deepest trance-like state. It’s when I truly bare my soul and if you ever want to see what I look like from the inside, all you have to do is watch me sing. I’m not saying I’m divine, I’m just saying that I have no control. What do you call that? Insanity? I feel that these messages come out for a reason and I would be wasting it if I didn’t share with as many people as I could. FPH: You mentioned that music can also express hatred and anger. Do you mean that in a negative sense or do you thing there is a balance in having music express darker emotions. Tyagaraja: It can be an outlet and expression and I am not one for censorship of any kind, yet at the same time, there are some things I’m quite conservative about. I think that it is the responsibility of the artist to know what energy they are putting out into the world and how it will affect people. What message are you trying to get across? That’s important, especially when it comes to younger generations that are so impressionable. They need to hear words of encouragement and love and so few have it. That’s my role I suppose – to counterbalance. There are enough bands out there that preach dastardliness, dunkerdliness, and overall low guna vibration behavior. I’m offering something else. I don’t advocate those things because that’s not how I live my life. I can only sing or write about the things that are real to me. I cover up beer banners with fabrics when we play because I want the youth gathered there to have those impressions wiped away from there subconscious for a moment so they can be open and free enough to touch the space inside where love rests. They’re already bombarded by ads of consumerism everyday. FPH: But I’ve never seen you look down on someone for drinking a beer so I’m assuming that covering up a beer banner isn’t a way to pass judgment, just a way of defining yourself and your message. Tyagaraja: Yes, in fact, Paramahansa Yogananda said that even the drunk is in search of God because they think that alcohol is going to fill the emptiness in their heart. Every human has the longing for something greater, they just don’t always know how to find it or even know what IT is. I’m no one to judge another person at all because I’ve been there too. The difference is in what I’ve decided to do with those experiences. This is their path…just not mine. I have a song called “We Will Meet Again” the lyric goes, “All it really says is to love all/ we all want someone who cares and understands/ I knew it’d be you” and that’s really all there is to it. People just want love and most have been deprived of it in one way or another. That might be why people feel so uplifted at our shows. That’s all I’m offering from my heart when I sing, love. 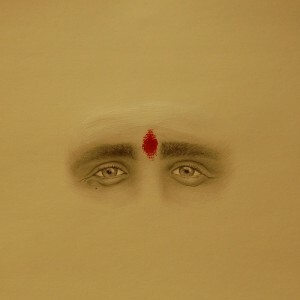 Hear the new single, “The Meaning of Life” by Tyagaraja, on Bandcamp. Earlier this summer, in a conversation about local music and musicians, a friend told me she plays keyboards for a singer who sounds like “a cross between Jeff Buckley and Freddie Mercury.” And I, being tired, irritable and of unsound mind, barked back, “He better be DAMN good! Cos’ those are two of my favorite vocalists. I saw Jeff Buckley twice in New Orleans and…” blah, blah, blah (Editor’s note: Insert self-righteous rock-crit blather here). The singer my friend was describing is named Tyagaraja (pronounced: “tee-aga-raja”). And as I heard first hand this summer at Julydoscope, an event where he and his band performed an inspiring and enthusiastically received set, the singer does indeed have a special voice, a powerfulvoice. But just as nobody else sounds like Jeff Buckley, who during his short life was compared to Robert Plant, Liz Fraser and Edith Piaf, nobody sounds like Tyagaraja. He sounds like himself. From onstage at Julydoscope, Tyagaraja, aka Jonathan Welch, told the audience he grew up in Hutto, a small rural town in Texas. Shortly after the end of his first marriage and his previous band, Million Year Dance, he experienced a crisis and awakening that would lead him to the culture and spiritual practices of the Far East, specifically India, a world away from the small town where he was born. Tyagaraja’s on- and off-stage clothes, hairstyle and bindi-decorated forehead are all part of a physical costume (for lack of a better word) that speaks to his profound inner transformation. He doesn’t presume to have answers to life’s deeper mysteries, but is willing to share his experiences, including his mistakes, and what he believes he has learned thus far. All of this is incorporated into his music and its presentation. …for every high-intensity amplification system used, there was also an Indian spiritual guru, African traditional drummer, or Native American rain chant…” Tyagaraja and his band are carrying on this tradition in their own contemporary and uniquely Texan way. So how did this alienated self-described “theater nerd” from Hutto begin his spiritual journey? Tyagaraja says that his training as a yoga instructor led him to explore the roots of that practice. The well-loved 1946 book Autobiography of a Yogi by Paramhansa Yogananda was, as it has been for many Westerners, an early source for information and inspiration. Tyagaraja recounts much of that leg of the journey on his blog, where he also provides a lot of practical, down to earth advice for gigging and touring musicians. During the first tour, Tyaga met his soulmate and now wife, Indian classical dancer Gunjen Mittal. 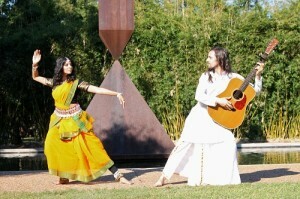 A member of Houston’s Avantica Academy of Odissi Dance, she often appears with him in performance, dancing, and giving a provocative spin to his blues and Southern-rock inspired music. After this grueling period of dharmic grunt work, Amma Sri Karunamayi gave Jonathan Welch a new name, which is not an uncommon way of acknowledging the personal and spiritual transformation a student has experienced. The word “tyagaraja” combines the Sanskrit word “tyaga,” meaning sacrifice, with “raja,” which means king, and is also the name of a well known 18th and 19th-century South Indian composer who in his lifetime wrote thousands of devotional songs. And yet, after all of his international traveling, Tyagaraja has chosen Texas and the cities of Austin and Houston for his home. He and I agree that Houston’s multicultural make up, the diversity of its residents including a large Indian population, which perhaps isn’t apparent unless you’ve visited and lived in this city, is one of its strongest attributes. 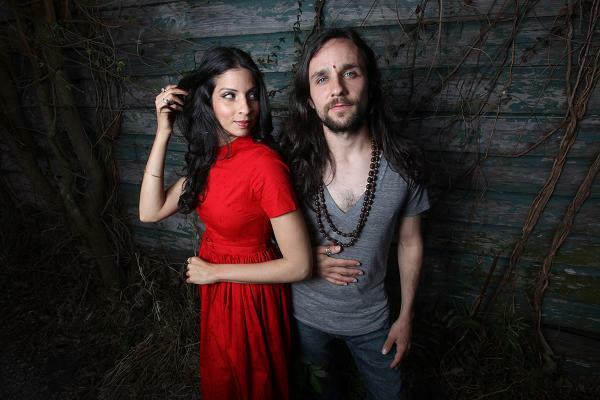 Tyagaraja’s band consists of a core ensemble augmented by several guest musicians from Houston’s indie-rock, Indian and blues communities, including violinist Hilary Sloan, guitarist Keegan Daleo, sitarist Aaron Hermes, drummer David Garcia, keyboardist Jeremy Nuncio, and bassist Mike Poulos. Tyagaraja’s father Michael Don Welch, who lives and plays in Austin, holds down lead and rhythm guitar duties. He plays with a distinctive and deep tone, providing some scorching lead lines and solos to the music. These players and many more appear on Tyagaraja’s most recent recording Open Book which is available for streaming and purchase on Bandcamp. In early November, Tyagaraja will curate a special weekend Art Music Life festival, presenting music, yoga, healthy eating classes, and opportunities for social activism. 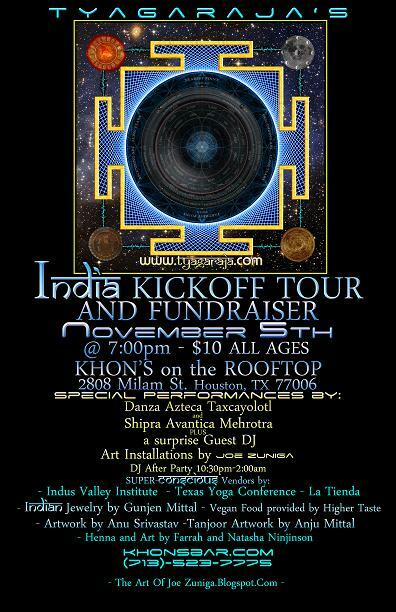 A tour of India will follow after that event through January 2012. For that tour, Tyagaraja and Mittal plan to collaborate with a group of music teachers in Pune to present music, dance and performance art throughout metropolitan India. Tyagaraja’s previous India tour included performances in Pune, Bangalore, Rishikesh and Delhi. A Kickstarter campaign to help with that tour is in the planning stages. Until that campaign is up and running, you can contact Tyagaraja through his website for more information about the India tour or the October Art Music Life Festival.